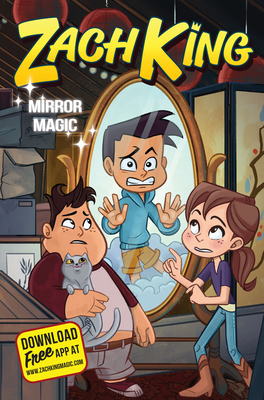 Zach King, the award-winning social media superstar with nearly 25 MILLION fans, is back with the third and final magical installment in his hilarious, fun-filled trilogy about Zach, a seventh grader trying to control his new magical powers. Features color graphic novel sections and an augmented reality app that brings the illustrations to three-dimensional life! BIG NATE meets DANTDM in the third magical middle grade adventure by social media superstar Zach King. Since Zach finally recovered his magical powers, middle school has never been better—he’s teaming up with his best friend, Aaron, on their super-popular YouTube channel and talking to the nicest, smartest, prettiest girl in school, Rachel. But when Zach magically “passes through” a magical mirror, he lands in a world that is the exact opposite of everything he’s ever known. Instead of finding himself at Horace Greeley Middle School, he’s at Horace Greeley MAGIC School. And in this world of opposites, everyone here has magic except him. Even worse, Zach is stuck in this world AND his alter-ego, the newly magical Jack, has passed in to Zach’s world and now living his life and getting into all sorts of trouble. Fortunately, Zach can always count on his friends—even this mixed-up magical world’s versions of them! If he can just convince the guys about the truth of his world-jumping misadventure, Zach knows, they’ll work together to figure out how to put everyone back where they belong—before it’s too late. It’s another hilarious adventure from the online and Instagram sensation Zach King. The book comes complete with a free downloadable augmented reality app that animates the illustrations in the book, bringing them to full three-dimensional life. Zach King is a twenty-six-year-old filmmaker who creates videos with a hint of “magic.” With more than 25 million followers across his various social platforms, Zach King is one of the hottest names in digital media. He’s been featured on Ellen and on the red carpet at the Academy Awards—and he’s partnered with Lego, Disney, and Kellogg’s to create mind-blowing videos. In 2016, Zach and his wife, Rachel, competed in The Amazing Race along with other social media superstars. Born and raised in Portland, Oregon, Zach now lives with his wife in Los Angeles, California, and has founded a multimedia production company to expand and create imaginative content for fans around the world.